If there’s one cheese that I’ve been craving more than any other during the past eight months of pregnancy, it would be Kunik. This triple-cream cheese from New York’s Nettle Meadow Farm is made from 75 percent goat’s milk and 25 percent cow’s milk, and the result is 150 percent spectacular. Thank the Lord that the Cheese Shop at France 44 usually has a button or two in stock when I stop in after yoga on Saturday mornings. A week without my Kunik fix is a bad week, indeed. As lucky as I am to find Kunik here in Minnesota, I can’t help but wish I lived close to the Nettle Meadow Farm in the Adirondacks. 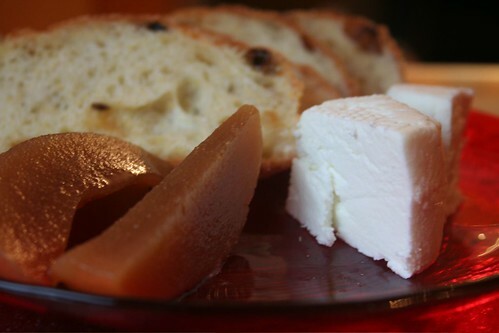 The cheesemakers, Lorraine Lambiase and Sheila Flanagan, make a variety of small-batch, hand-crafted goat cheeses mixed with yummy ingredients like herbs, olive oil, garlic, maple syrup and honey. You really can’t beat fresh chevre when it comes to cheese – the flavor is so rich and pure that you can eat it straight with a spoon. 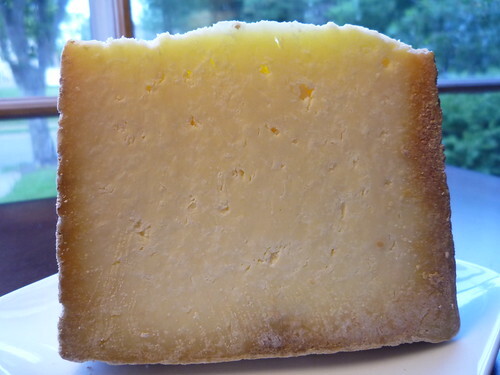 But since I’m not close to Nettle Meadow – and I have delicious Minnesota and Wisconsin chevres to devour – I will definitely take the Kunik when I can get it. 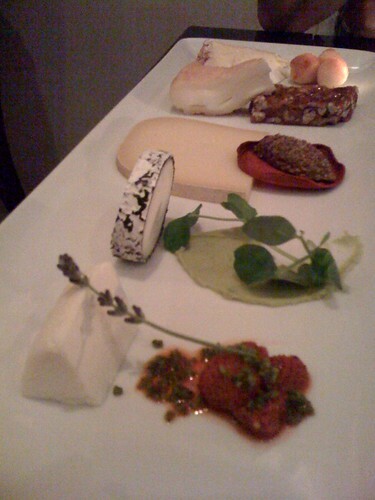 Though it’s been slightly aged, it still carries the freshness of a chevre with the luxurious creaminess of cow’s milk. If you can find a button, buy it and eat it in small wedges on a cracker or by itself. I’d be surprised if you can stop yourself before the entire cheese is gone! Before we get any further into fall (it’s October already?!) I need to fill you in on one last fresh goat cheese, the Coach Farm Medallion. 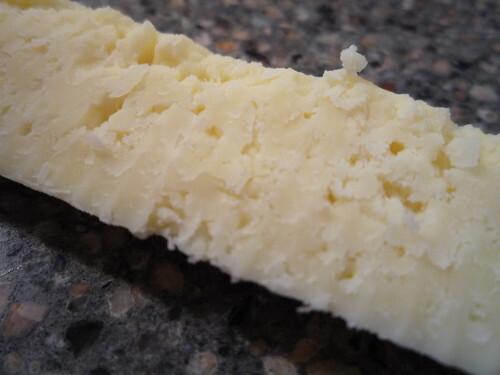 I didn’t think this cheese would be hard to find when I first saw it on the list, as my local cheese shop carries several Coach products, but they never seemed to have the Medallion, a small 4-ounce knob of creamy chevre. 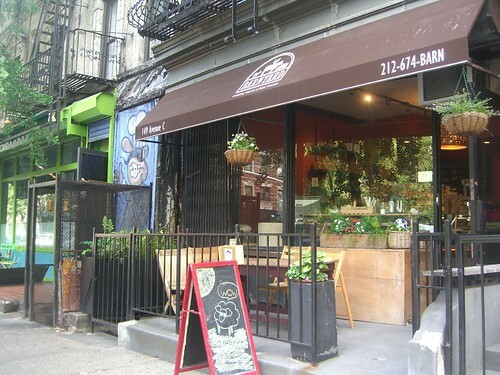 Coach Farm‘s goat cheeses were one of the first artisanal cheeses I can recall tasting, years ago on my first pilgrimage to the Union Square Greenmarket in Manhattan. My travel companion and I were smitten and brought back a jar of marinated goat buttons which I ate as slowly as possible to stretch out the supply. Yes, if you’re wondering, the Coach is that Coach, of handbag fame. The founders, Miles and Lillian Cahn, retired from the fashion business and moved upstate to enjoy a quiet country life with 1,000 goats. 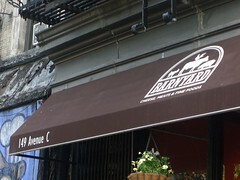 Their hobby quickly took off and their goat cheeses have been featured in some of New York’s top restaurants — including those of Mario Batali, who is married to the Cahn’s daughter. 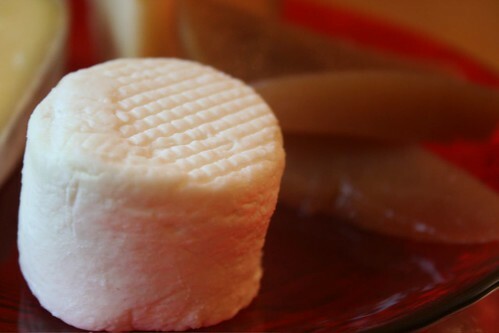 Today, you can also find Coach’s fresh and aged goats-milk cheeses, and their delicious drinkable “Yo-Goat,” at fine cheese shops across the country. I picked up the Medallion at Marlow & Daughters, an adorable little gourmet market in Brooklyn, on our last visit to New York. 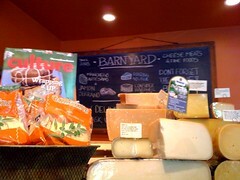 We enjoyed it with a few other regional cheeses and Brooklyn-made goodies from the Bedford Cheese Shop …. more on that soon! 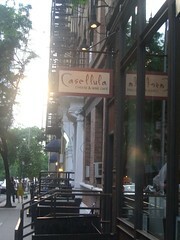 While we may be done recounting our New York cheese tour, I’m not quite done with New York yet. 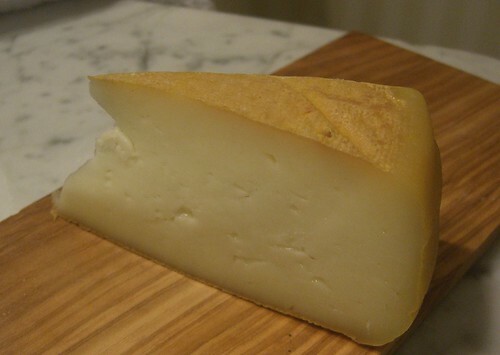 My cheese of the week, Ouray, is New York born and bred. Well, I guess “aged” would be the proper term, right? 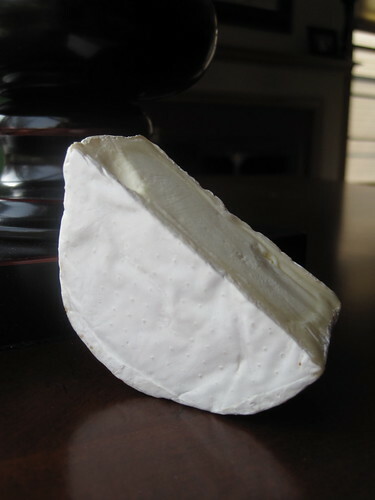 Ouray is one of the many raw cow’s-milk cheeses created at Sprout Creek Farm, a 200-acre farm in Poughkeepsie that also serves as an educational center for kids and adults interested in learning more about farming and environmental stewardship. 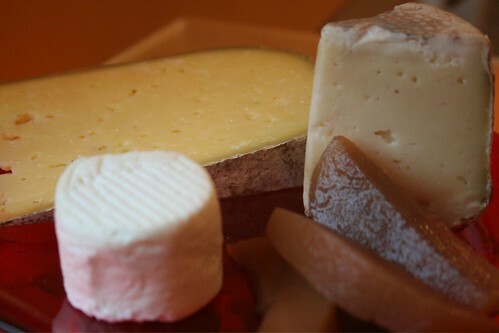 The milk for Sprout Creek Farm cheeses comes from grass-fed Jersey, Guernsey, Milking Shorthorn and Brown Swiss Cows, and the cheeses are made following European artisan tradition. 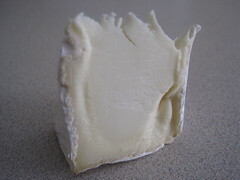 The Web site features a step-by-step photo gallery of the cheese-making process, a practice more cheesemakers should adopt for us nosy cheese lovers. Upon tasting Ouray, it’s obvious that the milk comes from grass-fed cows because the grassy, almost floral flavor is very prominent. The cheese has a lightness to it that is very pleasing on a summer evening, but its saltiness keeps it from being so light that its flavors disappear from your palate within a few seconds. Try it with a Cabernet Sauvignon and some apple slices for snack, or add a green salad and bread for a light dinner. 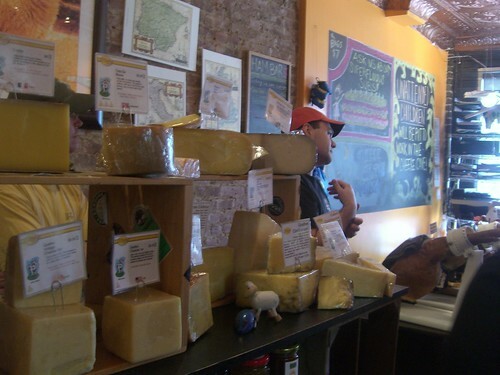 Special thanks to Benjamin at the Cheese Shop at France 44 (and the St. Paul Cheese Shop) for his help in bringing Ouray to Minneapolis for me!